View our platinum wedding rings here. Platinum wedding rings are back in style. After spending a few years in the shadow of gold and silver, platinum is once again a viable wedding ring option. You may think platinum is new since it hasn’t received the same attention as gold and silver. But the truth is platinum is very old. People as far back as the ancient Egyptians wore platinum, and King Louis XVI of France said it was the only metal worthy of royalty. Platinum wedding rings are highly prized pieces of jewelry. They are very expensive, and currently a trend among the rich and famous. But why is platinum so expensive? Well, because it’s extremely rare. More than 1000 tons of gold is produced every year. But platinum is so rare, until less than 200 tons of it is produced per year. It takes about five tons of ore to produce one ounce of platinum. And the process takes four to five months to complete. As with anything else, the more difficult it is to obtain, the more perceived value it has. Platinum wedding rings first became widely-available in the early 1900s. Prior to that, they were mostly available only to royalty and the extremely rich. But once Louis Cartier started to create platinum jewelry, it was available to whoever could afford it. The platinum jewelry craze swept America, and it became the metal of choice over gold or silver. However, that didn’t last very long. Platinum wedding rings went out of fashion in the late 1900s. Once World War II started, the US government declared platinum off-limits for all jewelry. It was to be used for military purposes only. As more countries became involved in the war, platinum was mostly used only for military purposes. This is when white and yellow gold, and silver became the wedding ring metal of choice. Couples cite numerous reasons for choosing platinum wedding rings. Among them is that platinum is more durable than either gold or silver. While gold and silver make durable rings, they are softer metals than platinum. Another bonus is that platinum is hypoallergenic. A person who is allergic to gold or silver could wear a platinum ring with no adverse reactions. Some people choose to adorn their platinum wedding rings with gold. It creates a beautiful contrast, but combining two different metals presents its own set of concerns. Even the highest quality gold or silver may cause an allergic reaction. Maybe not when the ring is new, but problems could develop over time. This is especially true with gold, as gold wedding rings rarely consist of 100 percent gold. But platinum is usually composed of 90 to 95 percent pure platinum. The one complaint about platinum wedding rings is they sometimes lose their luster over time. But this is true for most rings that are worn on a regular basis. Platinum wedding rings need care and attention to remain looking beautiful. Any metal, not just platinum, becomes less beautiful if not properly maintained. Oils from the skin, perspiration, tonic chemicals in water and air can all cause wear and tear on a platinum wedding ring. One way to combat deterioration is to keep the ring in a box, and only wear it occasionally. This will certainly protect the ring from damage, and make it last longer. But most people wear their wedding rings all the time, except maybe while bathing or washing dishes. So instead of hiding the ring away, a better option is to have a certified jeweler perform regular maintenance on it. A good jeweler will be able to keep the ring clean and polished. A good jeweler should even be able to repair a scratch with a simple polish job. Platinum is malleable, and isn’t very difficult to work with. So a platinum ring has just as many style possibilities as any other metal. Platinum wedding rings can also be used as engagement rings. They look great when paired with diamonds, rubies, or any other precious gem. Platinum rings have a white silvery sheen, and look similar to silver or white gold. So any gem that would look good in those settings would more than likely work with platinum as well. Platinum wedding rings are truly great pieces of jewelry that will retain value. But, they also cost much more than gold or silver. Budget is a huge determining factor in what type of wedding ring is best. If you must have a platinum ring, it’s a good idea to price a couple before committing to a purchase. You can shop online to get an idea of how much the ring will cost. Some couples even design their own platinum wedding rings. Everyone has their own style, so it only makes sense that some people don’t like mass-produced rings. It’s fun to go window shopping for jewelry, but there are many other people looking in that same window and picking the same exact ring. Because of this, most jewelers give couples the option of choosing their own settings, and picking their own precious gems from a large selection. As you can see, platinum wedding rings offer more pros than cons. Platinum is a precious and rare metal. It is durable, and with proper care, can last a lifetime. And it also looks good with gold and precious gems. Platinum is the perfect metal to symbolize a lifelong commitment. 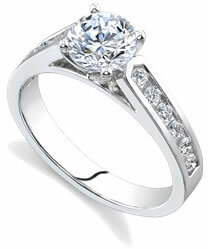 If you need help with finding the perfect ring, just give us a call toll free at 1-877-877-4141. We'd be glad to help you out.